How can you protect your tattoos from fading from UVA- and UVB-rays? The body's immune system wants to repel the ink under your skin. What makes your body keep the color in the skin? Certain perfumes and detergents (surfactants) can attack your tattoos. How can you prevent this? 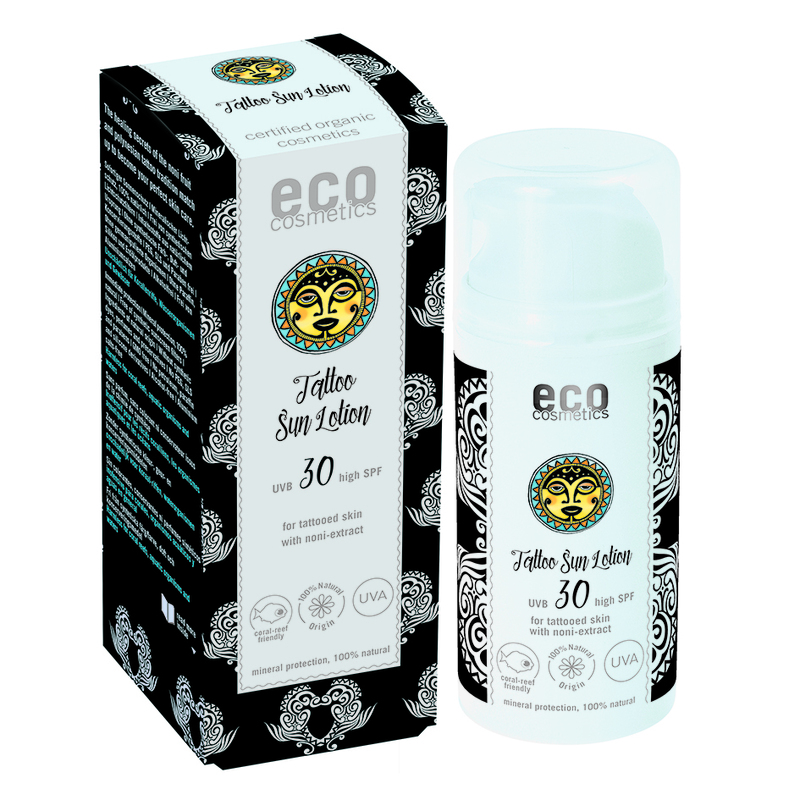 The ECO tattoo series consistently dispenses with all fats, oils or fragrances, e.g. Citrus oils that could harm your tattoos. With mild surfactants and the nourishing power of noni and pomegranate* this shower gel gently cleanses, nourishes the skin and protects the color of the tattoos. Für die tägliche Hautpflege mit Noni, Granatapfel* und Panthenol für den Schutz der Tattoo-Farbe. LSF 10 dient als täglicher UV-Schutz und mindert den ausbleichenden Effekt der Sonneneinstrahlung. Lotion mit den natürlichen Pflegeeigenschaften von Noni und Granatapfel*. Der rein mineralische Lichtschutzkomplex aus Titanium Dioxid, Zinkoxid, Korund und Magnesium schützt zuverlässig vor UV-Strahlen. Die wasserfeste Lotion kann für Körper und Gesicht verwendet werden. Leicht verteilbar, angenehmer Duft, Haut und Tattoos werden optimal geschützt. A tattoo is much more than simple body decoration. It is a statement. You show on your skin who you are. You invest time and money and accept the pain. You are proud of it and enjoy displaying it. The tattoo is a part of you and deserves the best skin care to protect it. In order to discover natural care with a sustainable effect for skin and tattoos we set out to seek the origins of body art. For thousands of years in the island world of the Pacific and Indian oceans “tatau” gave information about a person´s status and reputation, told a life story, were supposed to protect against evil influences and enhance sexual attraction. Tattoos were also an important part of the identity of the Maori. In order to prevent the colour of symbols engraved using shells or bird bones from fading or a blurring of their contours they used bark extracts, roots, leaves and fruits of the Noni tree. 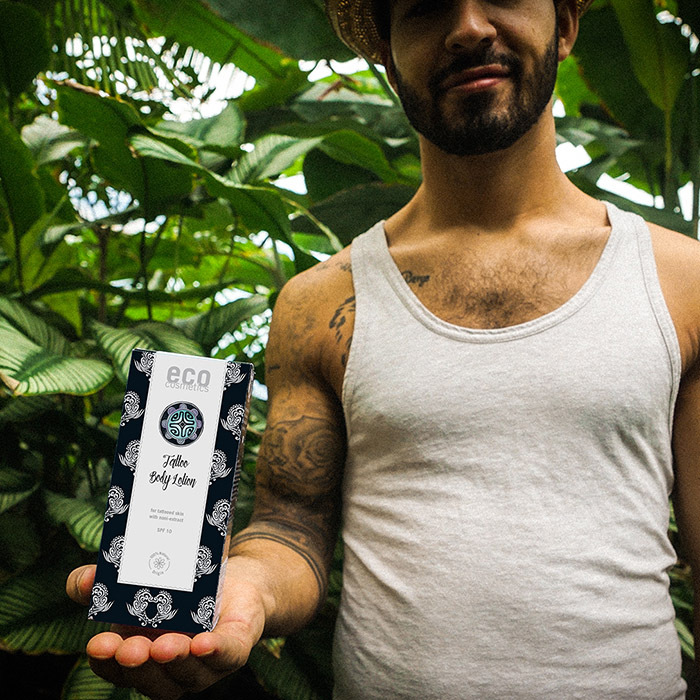 Eco cosmetics has used this traditional knowledge for the development of a range of care products for tattoos. eco cosmetics has combined the ancient knowledge of the valuable properties of Noni with modern and careful manufacturing processes. The Noni tree (botanical name, Morinda citrifolia) which originated in Australia was brought to Polynesia and regions in the Indian Ocean by ancient seafarers. Due to the high content of essential fatty acids the juice and the oil of its fruit are well tolerated by the skin and they provide intensive care. Noni promotes rapid healing of micro-injuries as well as preventing germs and viruses from spreading. Consequently the large phagocytic cells in the skin remain more passive and, in addition to unwanted intrusions, do not spoil the colour of the tattoo. In order to exploit these advantages eco cosmetics combines Noni with especially mild tensides, which do not wash the colour out of the skin. Certain fragrances (e.g. from citrus fruits) are also deliberately avoided. Some of their ingredients would be detrimental to the preservation of the colour intensity. In contrast, pomegranate with its anti-inflammatory anti-oxidants and phytoestrogens, which delay skin ageing, is a valuable supplement. This means the Tattoo range of care products provides the perfect properties for sustainable skin care and maintaining long-lasting tattoo colour and shine.